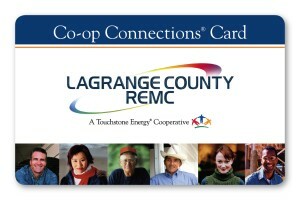 The Co-op Connections® Card is a valuable benefit of being a LaGrange County REMC member and it is FREE! The card allows you to receive national and local discounts on products and services and allows you to save 10% – 60% on most prescriptions. You can obtain details about online, national and local discounts offered by participating Touchstone Energy cooperatives across the country by visiting the Co-op Connections website. Use the search engine to find discounts offered in your community – or anywhere you travel. The list of participating businesses continues to grow, so check back periodically. Co-op Connections is just another benefit to being a member of your local electric cooperative. Search participating pharmacies and discount prescription prices. To add your business to the program: please call 502-493-3976 or Click here to email your request. Our recruitment team will be standing by to answer your questions.